Common Fish Names Beginning With "I"
Read about a variety of fish, from eye-catching cichlids to translucent glassfish, that begin with the letter I. Ice Blue Red Top Zebra (Metriaclima greshakei)—This pretty cichlid originates from Lake Malawi in Africa. It has a beautiful ice blue body offset against a bright orange fin on the top. Males are more colorful than the females. In home aquariums, they grow to about five inches and can live up to 10 years when cared for properly. This fish is appropriate for intermediate and experienced fishkeepers. 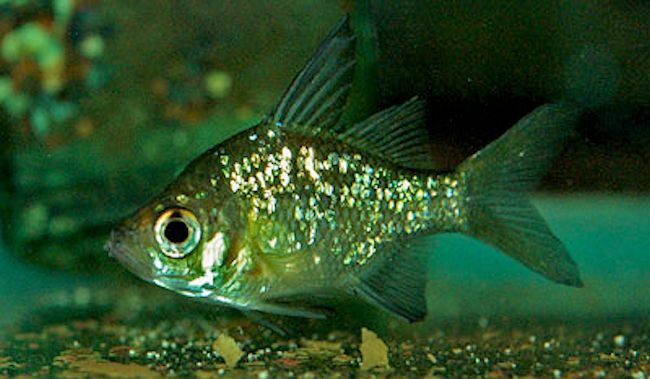 It is moderately aggressive and can't be kept with fish other than cichlids. You also need to perform frequent water changes to keep the fish healthy. Indian Glassfish (Parambassis ranga)—This fish is named for its translucent body. It's a schooling fish and likes to live in groups of five or more. If kept in smaller numbers, they will be shy and spend a lot of time hiding out. While not be aggressive, they can be very energetic. These fish are often injected with dye due to their transparent flesh, which results in fluorescent dots floating around its body. Most of these fish do not survive the dyeing process, and if they do, they are four times more likely to develop viral infections. Don't buy dyed fish as it will serve to perpetuate the practice. Indian Spiny Loach (Lepidocephalichthys thermalis)—This elongated Loach has a pale belly, mottled gray body and its eyes are on the top of its head. This is a very active yet peaceful fish that lives best in groups of at least three or more. However, don't keep them with shy or territorial fish. The Indian Spiny Loach requires a substrate comprised of sandy or small gravel as they like to burrow and need lots of places to hide. They also like some current in the tank since their natural habitat is swift streams. Inexpectatum Pleco (Hypoptopoma inexpectatum)—Hypoptopoma actually comprises nine species. This one grows to only 5-10 cm in length and it's a very quiet and peaceful fish. The Hypoptopoma's eyes are interesting—they are placed in a special position on the head which lets them observe in all directions simultaneously: up, down, front and back. Inexpectatum Pleco also takes care of its eggs in a very peculiar way; the eggs are not spawned in caves, but rather on open, vertical structures. Iridescent Shark (Pangasius hypophthalmus)—Fishkeepers are drawn to the shark shape of this fish. However, these fish don't act anything like the great whites. In fact, iridescent sharks rarely bother their tank mates. While all fish will eat most others that can fit in their mouths, iridescent sharks won’t touch another fish that's at least half its size. While these sharks have the potential to grow to three feet long, in actuality, these “sharks” are really catfish. In a tank, they won't get larger than 6 to 8 inches, or 12 inches if you're lucky. What Are Common Fish Names Beginning With W?